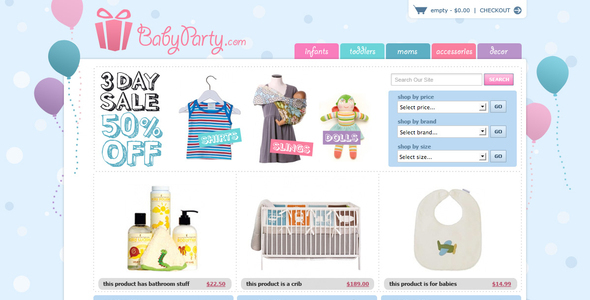 Here you can find the best baby website templates for your website which is on baby topic. So if you are looking for the themes and templates then you are at the right place. Select your template and enjoy your most attractive website. Designed by Sinote (http://themeforest.net/user/Sinote). 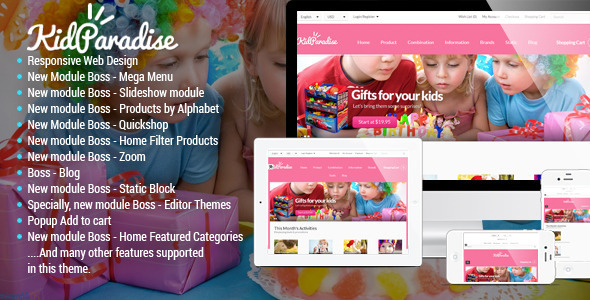 It is fully functioned with FancyBox Plugin and it has 6 Gallery Layouts and Kiddo Custom Testimonials Page, Shortcode Editor with Nivo Slider. Designed by nicdark (http://themeforest.net/user/nicdark). 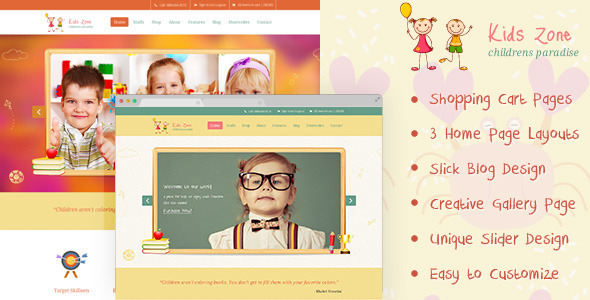 Baby Kids is a multi-page website and a Multipurpose theme and it has HTML files and Fully customized and optimized. This theme is ideal for any type of school. Kindergartens, primary schools, secondary schools, universities, colleges and academics. Designed by Foos (http://themeforest.net/user/Foos). 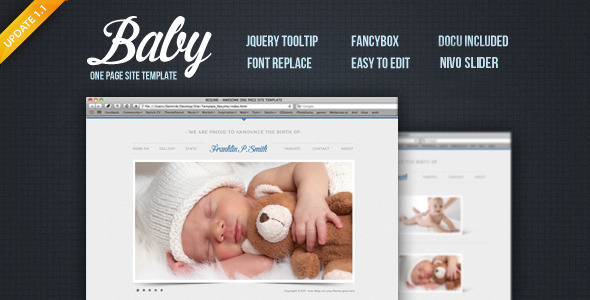 Baby is an awesome site template that can perfectly used to highlight the birth of a baby. It has Included with Nivo Slider. Designed by designthemes (http://themeforest.net/user/designthemes). It is a SEO Friendly and retina Ready responsive site with RTL Support and Page Builder with all demo page designs. Designed by MouseOnLeaf (http://themeforest.net/user/MouseOnLeaf). It is High resoluted / ready for retina displays with Multi language and it is SEO optimized and have a responsive design.It is the top-selling and best-rated feature-rich, multi-language, load speed and SEO optimized OpenCart template. 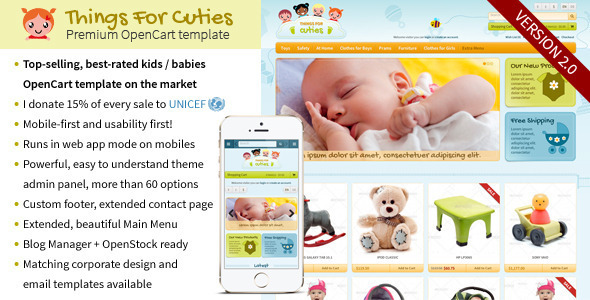 It�s compatible with OpenCart 1.5.2 to 1.5.6.4 and perfect suitable for any babies, children and kids eCommerce website, selling candy, toys, clothing or fashion at their online shop. Designed by NRGthemes (http://themeforest.net/user/NRGthemes). It is a SEO Optimized and responsive site with beautiful designs. Doozy is a Site template perfect for any clothing store, toy shop, kids, family, creative, childrens or art themed website. Designed by BuddhaThemes (http://themeforest.net/user/BuddhaThemes). It is fully responsive and SEO friendly template with Woocommerce supported and with Revolution slider installed. 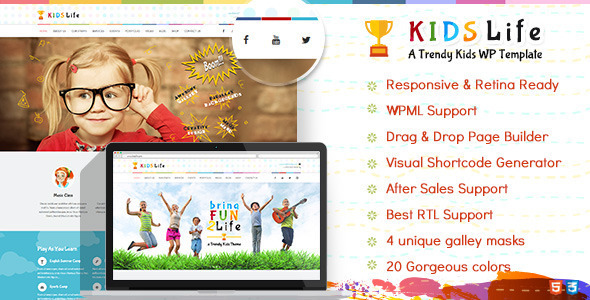 It is Easy to Customize layered PSD files for Children�s Clothing Website with all Shopping Cart Page Designs included. Clean and Vibrant design. Designed by CrunchPress (http://themeforest.net/user/CrunchPress). It is fully responsive design and Optimized. It is installed with jQuery enhanced slider and effects and PHP Contact Form. It is layered with PSD included. Designed by THNDRBOLT (http://themeforest.net/user/THNDRBOLT). It is Easy and customizable Photoshop files and Fully organized layers. It has Custom re-sizeable graphics with 3 full pages (Home Page, Single Product Page, Multiple Products Page). Designed by BuddhaThemes (http://themeforest.net/user/BuddhaThemes). It is equipped with Coded with HTML5 and CSS 3 with Layer Slider Included. It has Unique Portfolio Design, Amazing Blog Design, Beautiful Parallax Effects and CSS3 Animations. 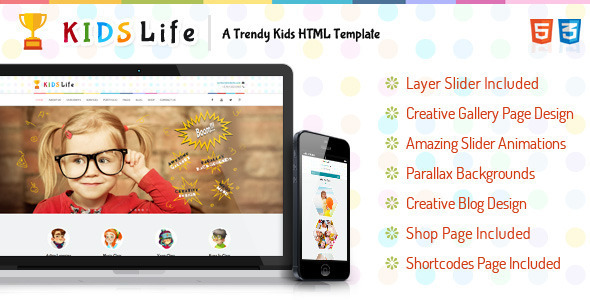 Kids Life is a beautifully designed HTML Template for kinder gardens, Day care, preschool and it would suit for any children, art, craft, school & Training Website. Designed by mad_velikorodnov (http://themeforest.net/user/mad_velikorodnov). 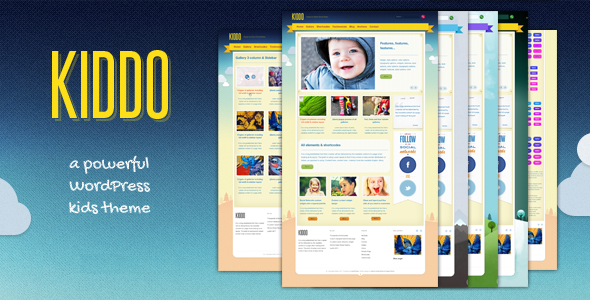 It is fully Responsive layout with Retina ready theme. 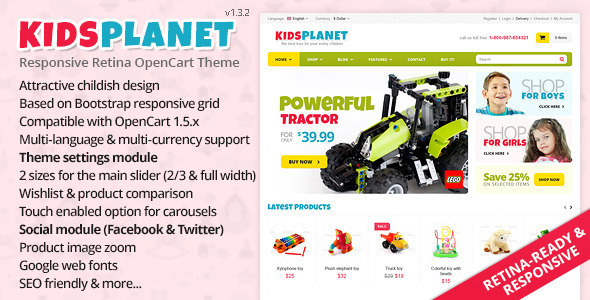 And it has attractive childish design compatible with Opencart v1.5.5.1, v1.5.6.1 and ocStore v1.5.5.1.1, v1.5.5.1.2. Based on Bootstrap 12 column responsive grid. 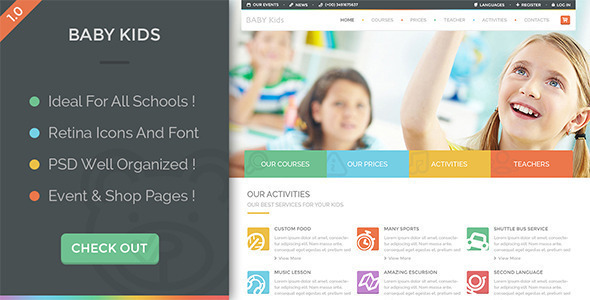 Designed by tvlgiao (http://themeforest.net/user/tvlgiao). It is fully responsible and SEO optimized with Boss-Slider it has a mega menu with different customized options and fully attractive and beautiful.